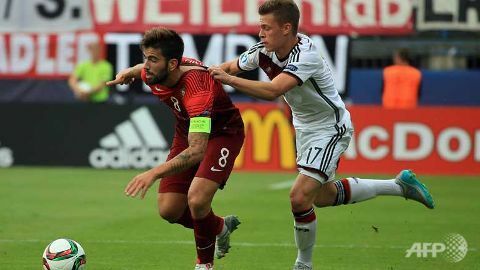 Outclassed, outplayed and outscored was the story of the Under 21 European Championship semi-final match between Germany and Portugal. A 5-0 win enough to seal passage to the final. But somewhat surprisingly were the victors, Portugal who sent the tournament favourites Germany back to Bavaria for a rethink. Despite having a World Cup winning defender at the heart of their defence and a Champions League winning goalkeeper behind him, Germany simply could not contain a rampant and free flowing Portuguese side that appears to grow more in stature as the tournament progressed. They now face one final challenge, a repeat match with Sweden tomorrow to see who will lift the coveted trophy. The last time these two met in the group stage the game was tied 1-1 in the end but in the final only one team can leave victorious. Germany will be watching that final with disappointment after failing to live up to their promise. The German squad was one of the strongest in a long time. In a week when English FA elite Director Dan Ashworth claimed that they couldn’t possibly ask full established internationals like Sterling, Barkley and Shaw to drop back down to Under 21 level, it was refreshing to see that other nations don’t seem to have the same hang ups. Germany called up Matthias Ginter who was part of the senior teams triumph in Brazil last year as well as goalkeeper Marc Andre ter Stegen fresh of his heroic’s for Barcelona in the Champions League cup final win over Juventus last month. In fact out of the squad of 23 players, six have represented Germany at senior level and have had no issues dropping back down to play in this tournament. That number could have been greater if not for injuries and lack of form towards the end of the Bundesliga season had not ruled out a few other players. Their passage to the semi-final was not exactly to plan with two draws and a win in the group condemning them to a second place finish behind Denmark. That put them up against Portugal rather than Sweden with the ‘Esperanças’ knocking them out. Portugal have been a revelation in this tournament with several players playing key roles in their success. It’s a talented batch that Rui Jorge has arranged with pace, skill and vision throughout. At the heart of his team is captain Sergio Oliveira. The central midfielder who plays for FC Porto is highly regarded in his homeland as well as throughout Europe with several clubs scrambling for his signature. Technically gifted with incredible close control and a good range of passing, Oliveira has been exceptional in the tournament so far with an 85% average passing accuracy that highlights this. Alongside Oliveira is another highly rated youngster, William Carvalho. The Sporting Lisbon defensive midfielder is wanted by numerous bigger clubs and his performances in this tournament will not have done his chances of securing a move any harm. A regular for the full senior team, Carvalho like some of his German counterparts had no issue spending his summer competing for the Under 21 Euro title and that dedication could now pay off. Portugal will be considered strong favourites after their stunning win over Germany on Saturday. Sporting Lisbon pair Ricardo and Joao Mario helped themselves to a goal each as did Benfica striker Ivan Cavalerio, Monaco’s Bernardo Silva and Malaga’s Ricardo Horta as Portugal ran riot. Silva in particular was instrumental in the win with the dazzling attacking midfielder proving why many in the game are comparing him to Portugal greats Rui Costa and Luis Figo. Winning the final is the end goal but in their way is Sweden who progressed to the final with a convincing 4-1 win over Denmark. Goals from John Guidetti, Simon Tibbling, Robin Quaison and Oscar Hiljemark cancelled out Uffe Bech’s strike for the Danes. Both Guidetti and Tibbling go into the final looking to score in order to seal the top goal scorer award. Currently both players sit on two goals with Czech midfielder Jan Kilment leading the way on three goals. But scoring against Portugal will not be easy, given that they have only conceded one goal so far in the tournament. That goal however was scored by Tibbling in their 1-1 draw in the group stage which will offer the Swedes hope. The final should be a spectacular end to what has been a fantastic European championship with two talented teams battling it out for the trophy.